All donations are in Trinidad and Tobago Dollars unless otherwise indicated. Make direct deposits or set up a standing order to donate to our Republic Bank Account 180482534101. 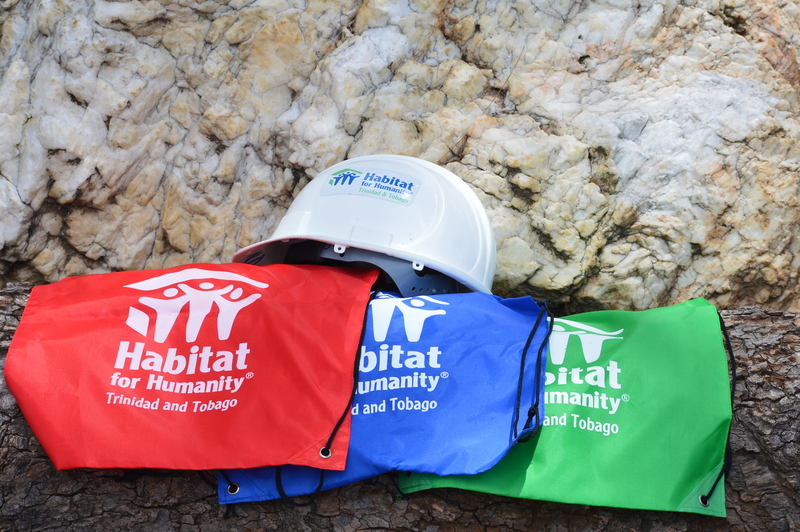 Call us at 1-868-398-7466 or email us at donate@habitat-tt.org to find out more. 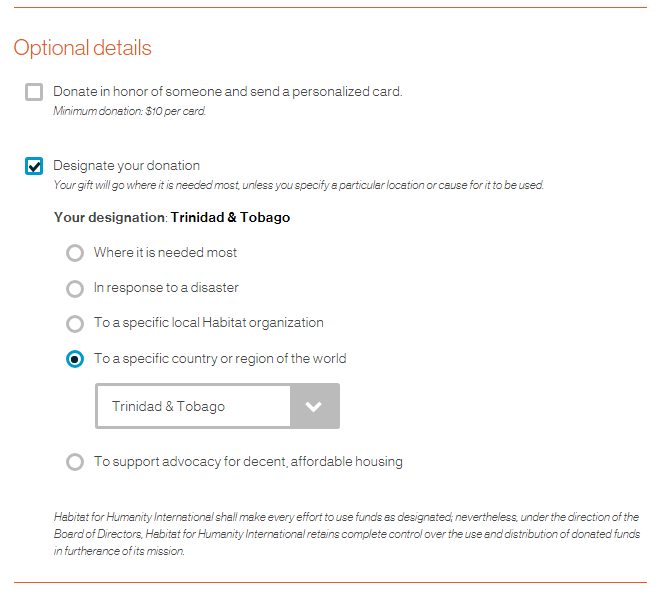 To ensure that your gift goes to Habitat Trinidad and Tobago, please “Designate Your Donation”, as demonstrated in the image here. Just as in a physical store, your Shopping Cart holds items until you are ready to check out. From your Shopping Cart you can: - Proceed to check out - Continue shopping You can always get back to your cart by clicking the 'Shopping Cart' button found in the navigation bar. If you click on the Shopping Cart, you can remove any item from your Shopping Cart that you no longer wish to purchase. Select the item or items that you would like to remove from your Shopping Cart, then click the 'Submit Change' button and the item will be removed. Click on the 'Order Status' button, type in your Order Number from your online confirmation and click 'Submit'. If you do not know your Order Number, click on 'Order History' and then click on the Order Number you wish to review. You should also have received an e-mail confirming the order after you place it. Please contact donate@habitat-tt.org if there is a problem with the product or transaction. Are all the transactions on the habitat-tt.org Site secure and safe? Is my personal information secure and safe? All transactions are processed securely using 128-bit encryption. Credit cards are processed via a secure socket (https) also using 128-bit encryption. Habitat Trinidad and Tobago will never sell your personal information supplied to this site. Where are the habitat-tt.org products stored? All products are available from the office in Aranjuez, Trinidad and Tobago. We do not offer delivery services at this time. All orders can be collected from the office at El Socorro Extension South and Chootoo Trace, San Juan, Trinidad and Tobago. Please send an email to donate@habitat-tt.org and specify the error message you received, what browser you are using and at what point in your shopping experience you received the message. How do I contact Customer Service at habitat-tt.org? The habitat-tt.org Site is committed to providing the highest quality of customer service. Please contact donate@habitat-tt.org with any comments or service needs that you may have regarding an order. You can also get in touch by phone at 868-675- 1222. Hours of operation are 9:30 am to 3:30 pm AST (-4:00 GMT/UTC) Monday through Friday. If you have merchandise suggestions for our site or you would like to share your comments regarding Habitat Trinidad and Tobago, please contact us via email or telephone.